Our choice of 2 varieties per 12 eggs; 4 per 24 eggs from these breeds: BROWN CHINESE, AFRICAN, WHITE CHINESE, EMBDEN, TOULOUSE OR ROMAN. Shipped USPS Priority Mail. Available from April through 1st week of June. Before ordering goose eggs, please check with the Regulatory Agency in your state that controls wildlife management. You may need a permit. Available from April through the 1st week of June. Because of conditions beyond our control during incubation, we are unable to guarantee hatchability. However, all the eggs we ship will be fresh and guaranteed to get to you in good condition. All egg shipments are insured. Report any broken eggs to your postal office or delivery driver. Call us for replacements. 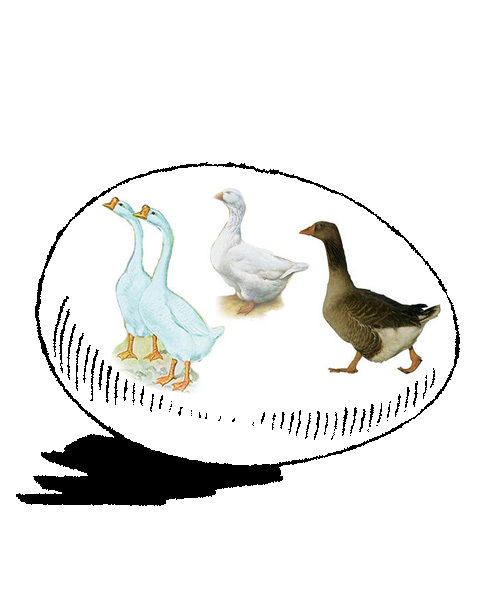 We ship goose eggs to all states, except Hawaii. All egg orders are Shipped Prepaid. No, there is a 10 day window for delivery time. But after they are shipped arrival would be within a couple days. We sell the eggs mainly for hatching, not consumption. Would you ship African Goose eggs to BC, Canada? We are not able to ship any hatching eggs to Canada. 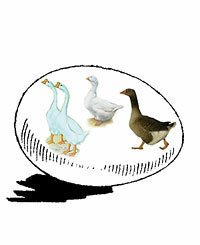 Can I buy a specific breed(s) of Goose eggs? Sorry the Goose Eggs are sold as a variety package. We are unable to confirm exactly which breed you would be receiving in this assortment. how often does a goose lay. Geese are seasonal layers. They will produce an average of 35 eggs per year starting in spring and ending in summer. Most will lay an egg every couple days.